The website has the option of having an Event Calendar Pro. calendar is a powerful communication tool, if used correctly. 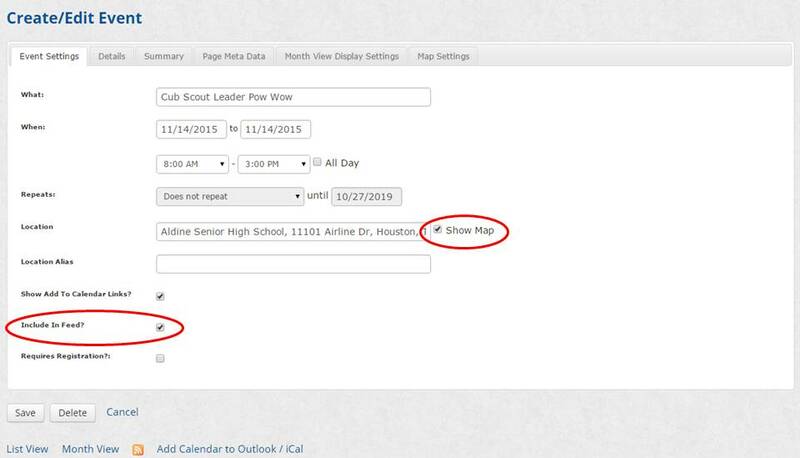 The calendar information should be generic and point the Scouter to an event page for more information. 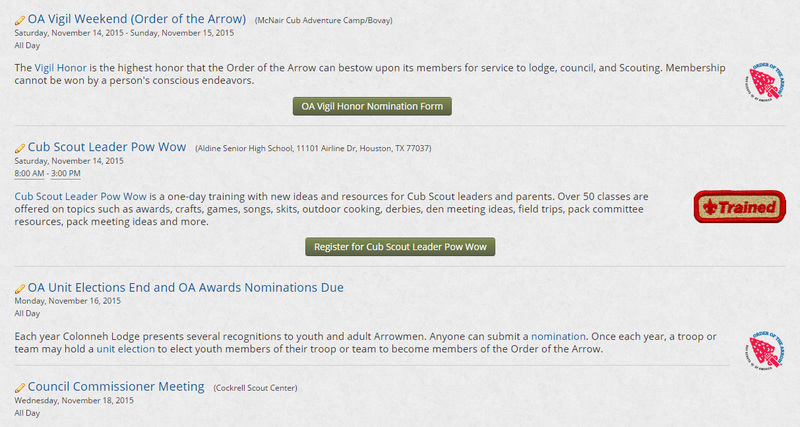 It is important that a Scouter read information about the event (e.g., what to bring, rules, schedule) before registering. The calendar should contain district events and key council events (e.g., Scout Fair, University of Scouting, Fun with Son). On the calendar page, click on Add Event. Add the What, When and Location. Alway have Included in Feed checked to it shows up in RSS feeds. There is an option to Show a Map. Using repeats is not recommended. 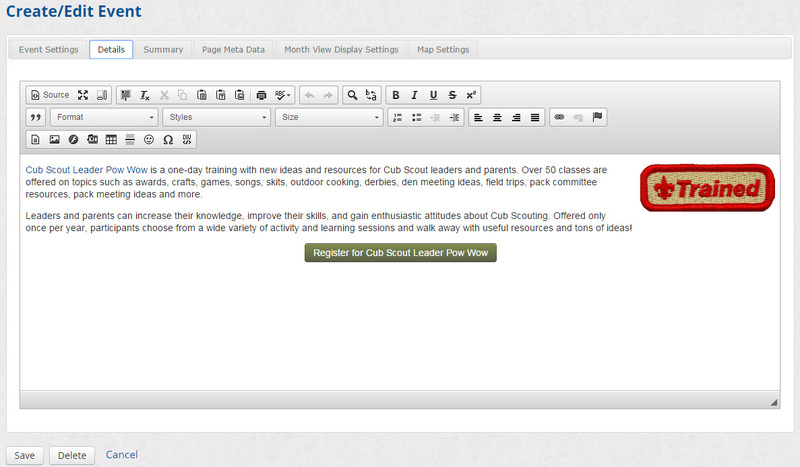 Categories: Select Homepage for events that you want included on the Home page feed. Do not put include council events in the homepage categories as these are automaticlly fed into the the homepage feed. Information on the Details page is critical as this is what is seen when clicking on a calendar event. Click on the Details tab to add information about the event. Write a generic description of the event. Staying generic is very important, so next year you can just change the date of the event. 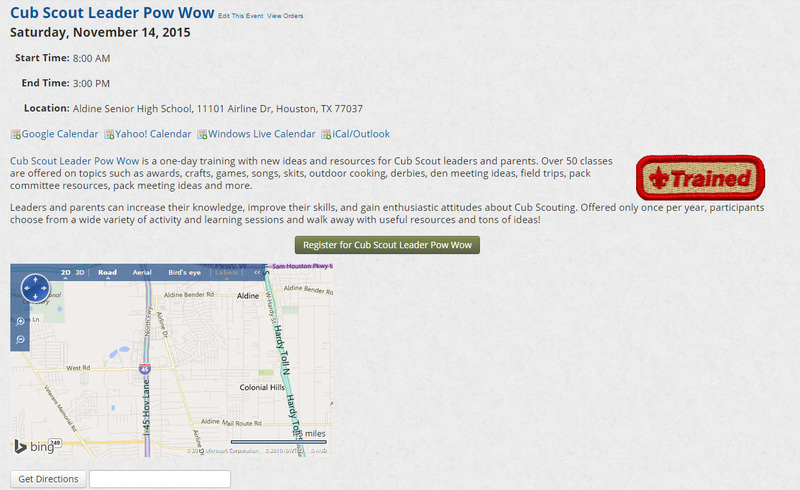 It is recommended that you add a graphic and a green button with a link to the event page for more information. Do not use the calendar in place of an event page. Details about the event are to be placed on the events page. Always link to the event page for the registration link, this will let the viewer see all the information posted about the event (e.g., what to bring, schedule). 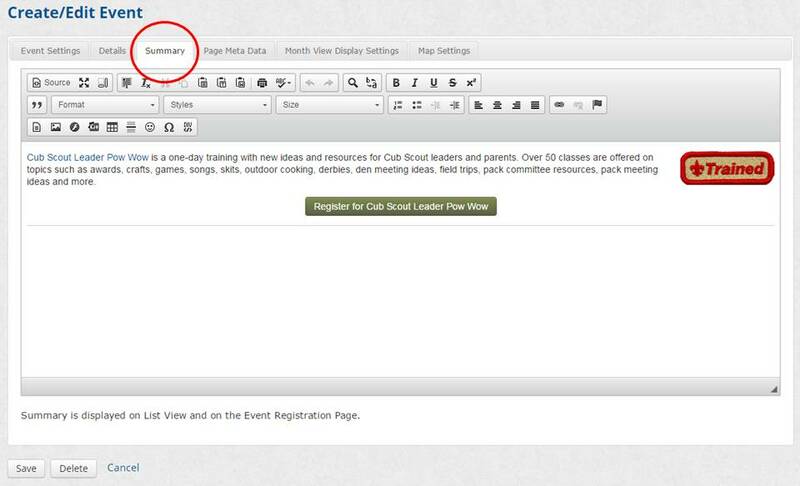 Information from the Event Settings tab and Details tab is seen when you click on an event on the calendar. Information on the Summary tab is critical, as this is what shows up when clicking on List View, and what is seen on a mobile device. Keep the summary very short, Write a one or two sentence generic description of the event. Optional (but highly encouraged): add a small graphic and use a green button with a link to the event page for more information. Add a horizontal line to help break up the events when seen in list view.